Word-nerd English teacher that I am, it took me a while to realize that not all my students love literature the way I do. 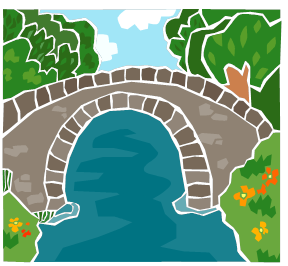 Eventually I learned to look for ways to build bridges from what students need to learn in English to what they want to learn in or out of school, in other content areas or on their own time. Sometimes those connections are planned into my curriculum, and sometimes they are more serendipitous. But even the serendipitous ones can be made more likely by staying on the alert for what students are interested in and how that might connect with class. Why are connections so important? They not only pique interest and deepen understanding, but also they are what are necessary for solving real life problems which don't come labelled math, social studies, science, or English. What are your students interested in outside of your class, whether in other classes or on their own time? How do you connect with those interests? How could you? P.S. If you haven’t heard of Hamilton and you are interested in theater, music, American history, or American young people, you might want to check it out. Hamilton, the biggest thing on Broadway, is being taught in classrooms all over. Newsweek. 2/9/16. How teachers are using Hamilton the musical in the classroom. Mind/Shift, KQED. 3/14/16.